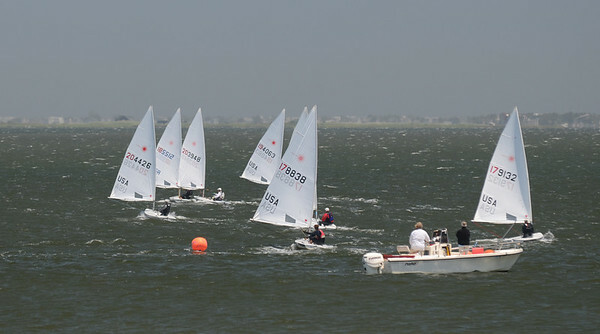 Day 2 at the Laser District 10 Championship and we had more wind and cloudy skies for 3 more races. The first race was about a mile top to bottom and we did two grueling laps. 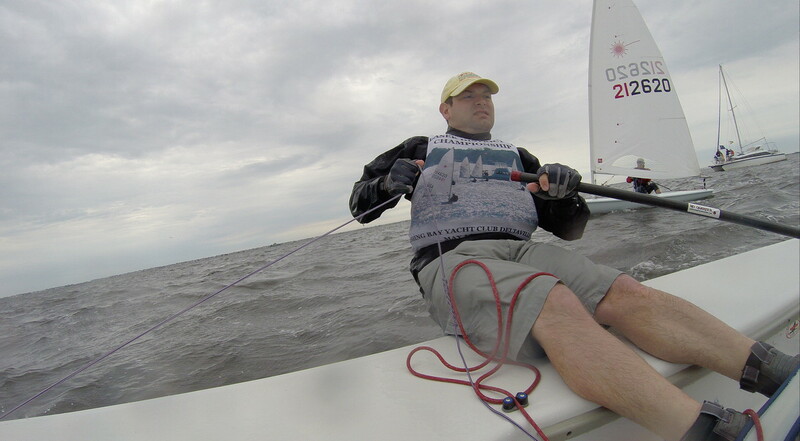 I had a great start and had good boat speed at times upwind. I played it conservatively so as not to flip. This was especially challenging down by the bottom mark where the seawall was reflecting the waves back upwind making it feel like a washing machine and I buried the bow multiple times sailing upwind with a full cockpit of water. I finished 11th – my fourth 11th place finish in 6 races. The second race was more of the same with another knot or two of breeze. I started and decided to call it a day as I wasn’t going to change my finish much missing the last two races and would only wear myself out before a long drive home and before rain moved in. It was nice to see Shore Acres Yacht Club – I can’t wait to see it when the clubhouse is finished. Always great to sail with all the very competitive D10 sailors and I’ll be back in D10 for the Laser Masters Nationals in August. Friday night after work I made the trip up 95 for the Laser District 10 Championship at Shore Acres Yacht Club in Brick New Jersey. I managed to miss most of the traffic around Washington DC and made good time arriving at the club at 11 to spend the night van camping. In the morning we were greeted to beautiful sailing conditions and a tad more wind than had been forecasted. The winds started out of the north east and slowly shifted to the south east over the course of the afternoon at 8-12 knots under mostly sunny skies. 21 competitors in what would be a very competitive fleet. On the water I inconsistently sailed consistently – meaning I’d have some bad legs and some good legs and I always managed to finish mid-fleet in either 11th or 13th place in all 5 races. I had moments where I was in the top 5 and the bottom 5 of the fleet. We sailed a modified windward leeward course that at one point was probably 1 1/4- 1 1/2 miles from top to bottom which made for a very long downwind leg. Despite the long legs and my terrible starting it was a great day of racing and it felt good to be back in the boat again. Laser District 10 Championship is underway at SAYC! After racing I went for a run, enjoyed drinks and tacos on the beautiful deck facing the water and met some of the other Laser sailors and SAYC members. A band played at the club while the sun set. 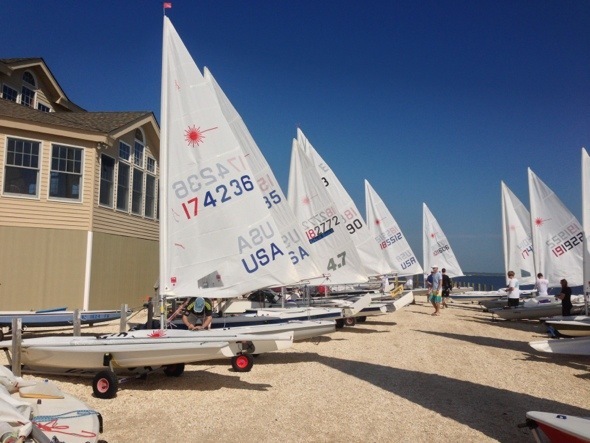 Little Egg Harbor Yacht Club was host for the 2016 Laser District 10 Championship in mid-June. 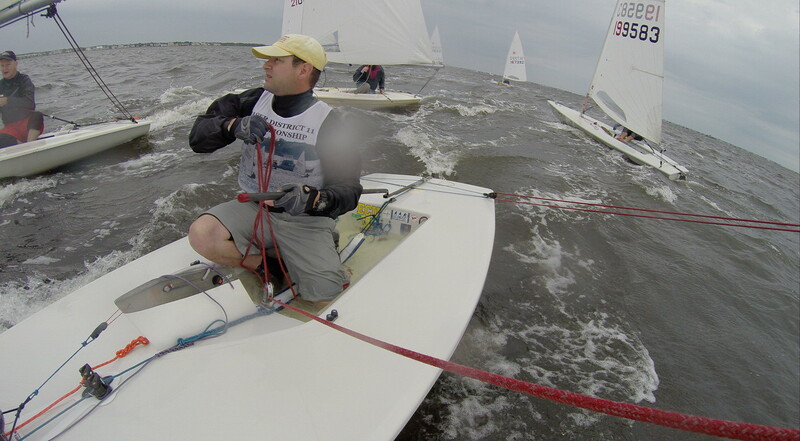 Winds were light for the first 5 races on Saturday and I finished 13-11-5-11-9 to be 10th after the first day. 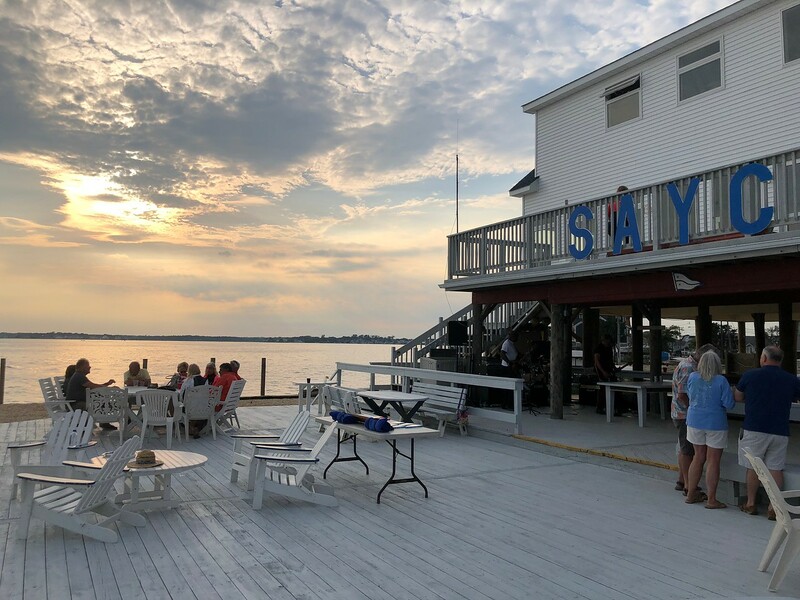 That evening had dinner with a few of the District 10 sailors and caught a beautiful sunset at Brant Beach Yacht Club. On Sunday it took 2 hours of postponement for the wind to fill and then we sailed 2 more races in 10-14 knots. I finished 9-10 and stayed in 10th overall. 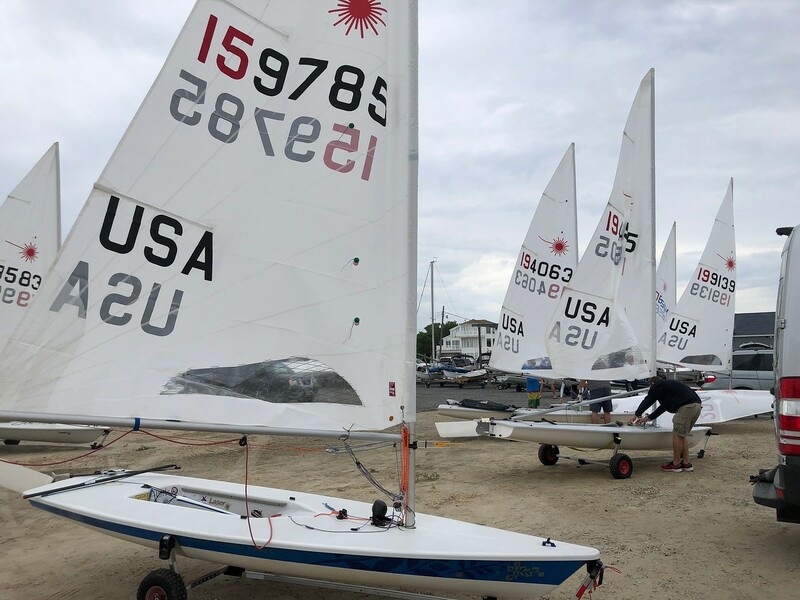 Despite a dismal forecast we ended up with better wind than Saturday for the 2nd day of the Laser District 10 Championship at Manasquan River Yacht Club. 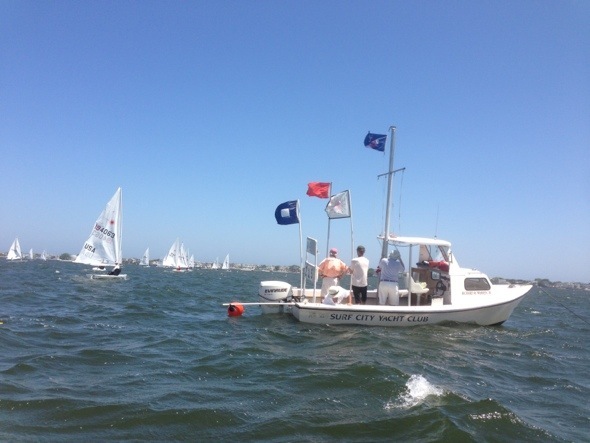 Out on the ocean course we started on time and sailed 3 races in 6-9 knot breezes. I generally didn’t start well which put me in a tough spot for the first beat and I settled for just below mid-fleet in each race. The excitement for the day was the ride in – since we had better wind than expected, we finished the racing sooner than expected and before the current turned to go back into the river. So to return to the club we were sailing downwind and up current. Most of the trip was fine until we got to the bridges. The railroad bridge is only about 40-50ft wide and only 1 maybe two boats can get through there at a time. The current also rips through the 1 span that boats can go through. With some well-timed and vicious sculling and pumping I made it through on the first try. Others weren’t so lucky and had to make a couple attempts, get a tow, or one unlucky sailor made it through only to be pushed back into the bridge where he went back under it tipped over while trying to be towed out. The 2nd bridge was a little easier, but still a struggle to get under. 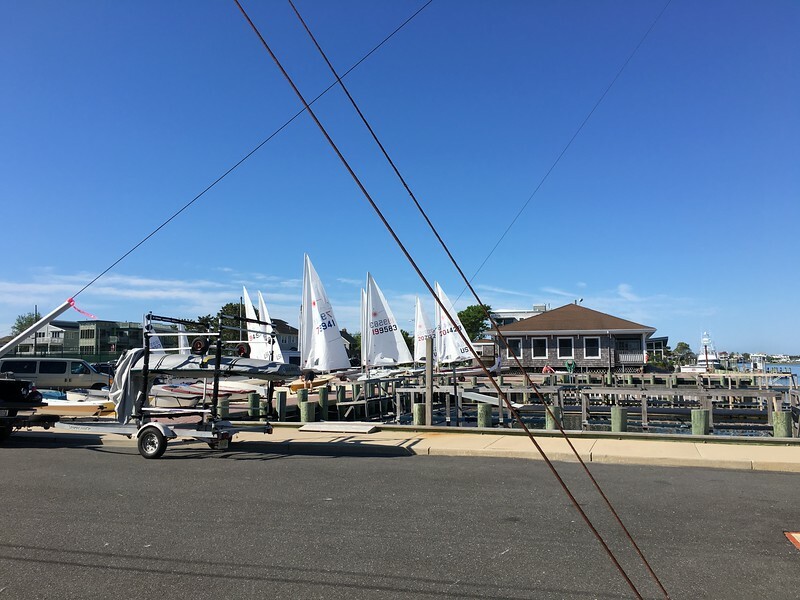 In NJ this weekend sailing the Laser District 10 Championship at Manasquan River Yacht Club. Prior to sailing here all I had hear about the place is that the channel was really narrow and the current runs really strongly. The ride out to the course was pretty interesting. Not only is was the current taking us out, but there is a bridge to go under and a railroad bridge that closed just before we got to it, so we had to circle and not be swept into it by the current. We made it out to the channel where the wind was blowing 15+ on the ocean with small white caps and a bit of a swell coming out of the south. 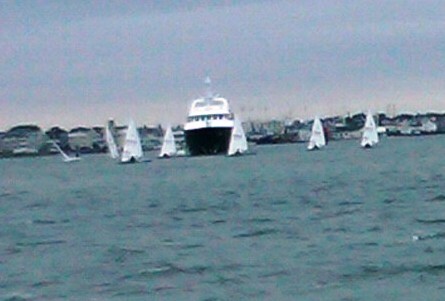 The first race got underway in quite a bit of wind. I made a mistake while repairing my bailer that kept me from being able to open it. So in the sloppy waves my cockpit filled up with water. I got around the course, but just never really had it figured out and was deep. By the second race the wind had mostly died out to just a few knots. I won the boat and got a righty just after the start allowing me to just punch out by 1/4 way up the beat. I led until the last 1/4 of the last leg where Mike Russom finally reeled me in and picked a few better shifts at the finish of the shortened course leaving me with a 2. The 3rd and 4th races were also sailed after waiting for the wind to settle. Both light-air affairs. The only highlight was banging the left corner so hard to hook into more pressure that I was able to reach into the mark passing 5 boats. Why there were so many boats to pass was given my finish position is another story. I’m currently in 11th and with a couple good races tomorrow I should be able to move up a few spots. 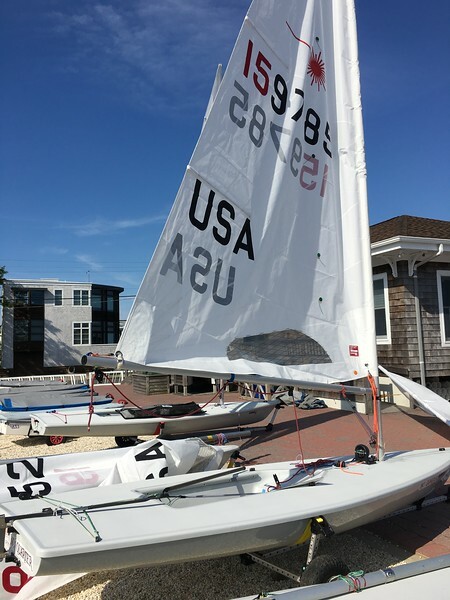 I was supposed to be on my way to Cape May New Jersey today for the District 10 Championship Regatta at Wildwood Yacht Club and Corinthian Yacht Club of Cape May. I was looking forward to visiting with NJ sailors and visiting a new club. I was also looking to avenge a demon of the last time I was in Cape May and had a run-in with yacht in the harbor. That wasn’t going to be. Last night when I was loading the Laser I slipped with it and it fell off the car with the bow hitting with a thud. It got a small crack in the gunwale and there were several inches of the hull/deck joint that separated where the boat flexed so it was clearly out of commission. It’s fixable, but it will be a while. Me, the car and the ground made out with out any scratches. 159785 was one of the boats at the Atlanta Olympics in 1996, has a great logo on the side of it and was a very well made boat. I was fortunate that the boat was a spare for that regatta and didn’t get as beat up as the other boats. We picked it up at the beginning of 1997 and it served me well for the 17 years since. But with any boat sailed that hard for that long – it was beginning to show its age and have little things go wrong with it from time to time. Almost exactly a year ago I was in NJ and the traveler fairlead pulled out. I had planned on getting a new boat in the next year anyway so might as well move that up and pick up a new boat to use while the old one is getting fixed. Eventually, I’ll keep the old boat at the club for local sailing and keep the new boat in Richmond ready for travel events. The name for this boat will be No Quarter. That’s the beloved battle cry of my ECU Pirates and loosely means show no mercy, take no prisoners and accept only unconditional surrender. I ultimately decided I had enough things go wrong for one weekend and didn’t want to temp fate any further by trying to race on a brand new boat… so I thought it best to sit this D10 Championship out and get the boat put together and take it easy this weekend. I’ll have the boat out for it’s maiden voyage tomorrow. Day 2 of the Orange Coffee Pot Regatta and Laser District 11 Championship was forecast to start a lot like Saturday finished: windy. Already a number of sailors weren’t going out. I rigged hoping to hang in there for as many races as I could. As I was about to head to the launching ramp, I noticed that my traveler fairlead was starting to pull out of the deck. Luckily Don Hahl had a spare hull sitting on a trailer (thanks Don!!!). 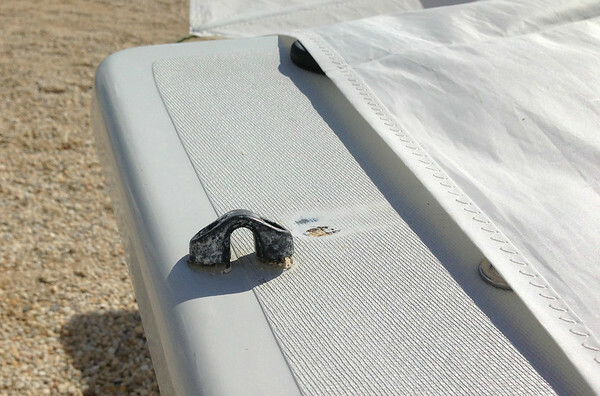 In a 10-minute mad dash we pulled everything off my boat and re-rigged it on the spare hull. I hung in there through 2 races in winds in the 20+ range. There were some shifts to be found, but mostly it was just hanging on, keeping the boat moving and keeping it upright. By the end of the 2nd race I started getting the tipsies. I started the 3rd race, sailed to the windward mark and just sailed in for the dock. At that point I was worn out and wasn’t really doing much racing anyway. Back at the dock I packed up, made arrangements to get the boat fixed and got on the road (without the boat). 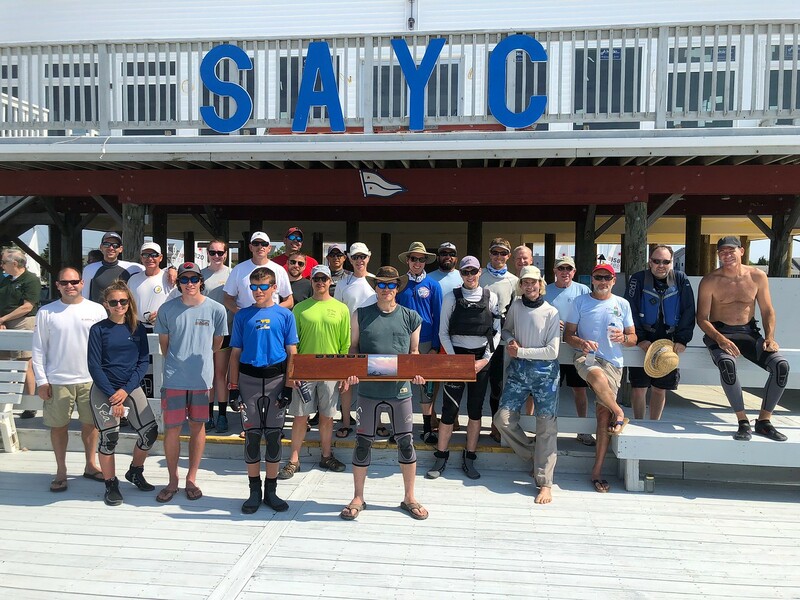 We had a windy first day of racing at Surf City Yacht Club for the Orange Coffee Pot and Laser District 10 Championship regatta. 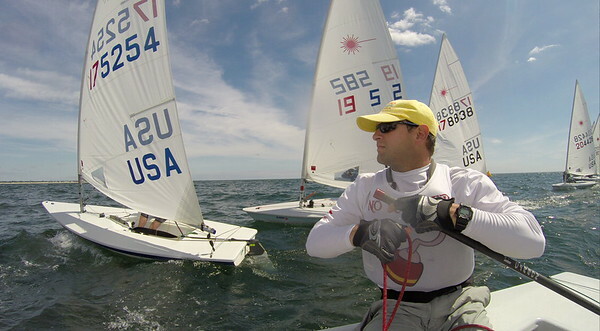 I sailed consistently with finishes averaging just out of the top 10 to be sitting 10th overall after the first 7 races. Throughout the day the wind built from about 12 in the first race to over 20 by the 7th race. The sailing location was slightly behind a shore that kept us the waves down. 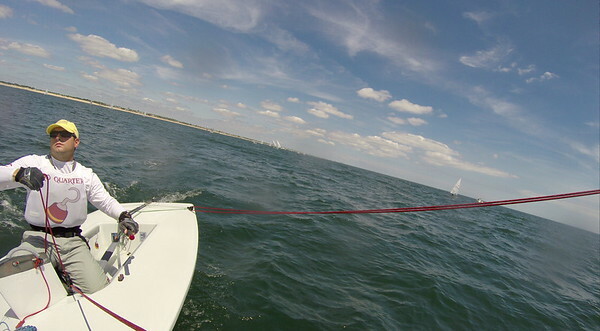 In fact it was disorienting to have 18 knots of wind later in the day and only 1′ waves. On the shorter courses that we had I found it was important to get good lanes, keep clear air and pick lanes to cross so I didn’t have to duck boats. We’re looking at another windy day on Sunday. 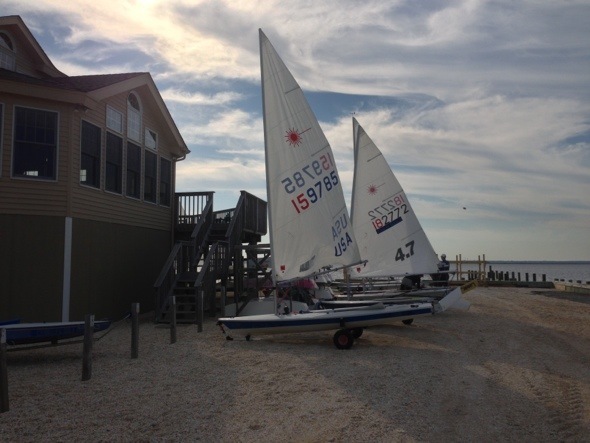 I have arrived in Surf City NJ on Long Beach Island for the Orange Coffee Pot Regatta and Laser District 10 Regatta. 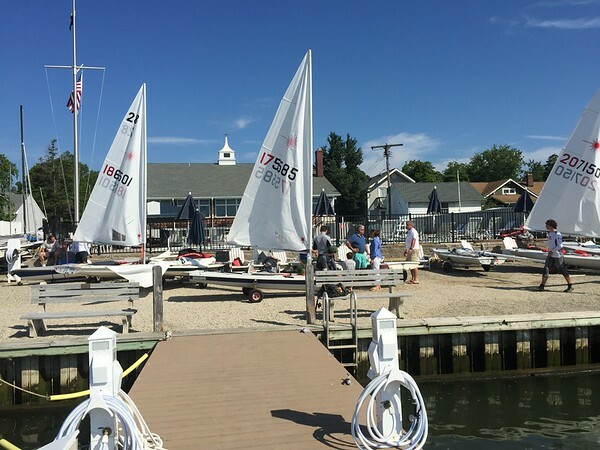 I got here late in the afternoon and joined a few other sailors for about an hour of practice. The wind was in the middle to upper teens which is what we are going to see a lot more of this weekend. As a follow-up to my post from Sunday it turns out there is a photo of the yacht coming up the channel through the race course. I believe this was taken from the weather mark boat. At the point the picture was taken, I’m already along side the yacht, and my boat is on its side and I’m sitting on top waiting to right it.